Wellington House is a high quality industrial/distribution facility that was constructed to a traditional steel portal frame design with insulated proﬁle steel cladding to the elevations and roof which also incorporates roof lights. Elevations are full height block work over clad with proﬁle metal sheet cladding to an eaves height of 6 metres. The building is accessed via 6 loading dock levellers and one ground level access door that provide access to a large concrete yard. 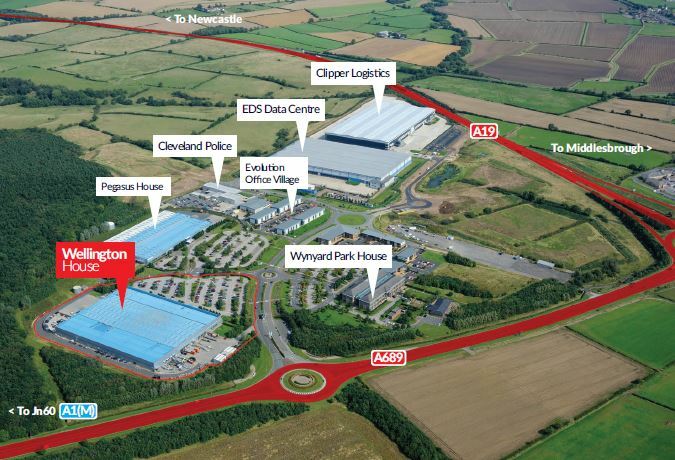 Wellington House is located at Wynyard Park which is regarded as one of the largest and most successful business parks in the north of England which to date has attracted over 60 companies employing over 1,500 people. The property is available to let on a New Eﬀective Full Repairing and Insuring Lease at an annual rental to be agreed.